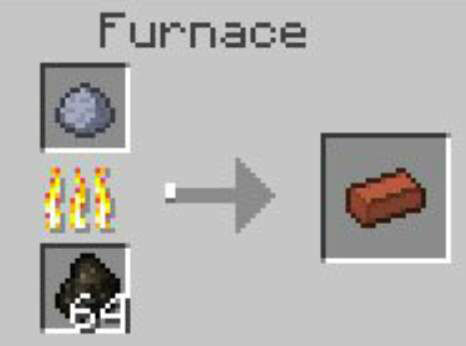 Bricks have fire immunity (as does cobblestone), making them an ideal block to build in certain situations, such as making a fireplace. Bricks can be crafted into a block, slab, or staircase. Bricks are made through a process known as smelting and require the following ingredients and items: clay balls, fuel (charcoal), and a furnace. Obtain a clay block. Clay blocks can be found near rivers or lakes. Break the clay block by hand or with shovel. This will produce one of the required materials for creating traditional bricks, clay balls. One block of clay will yield 4 clay balls. Place the clay balls in the top slot of your furnace grid. Place a fuel source such as charcoal in the bottom slow of your furnace grid. Move your newly crafted bricks into your inventory! Following this process will result in a traditional red brick. It is possible to create other types of bricks including stone bricks, nether bricks, and more. View the following slides to discover the different types of Minecraft bricks (and stones) that you can craft and utilize! Each type of stone brick has similar properties but different textures. Any mixture of stone brick can be used to craft slabs or stairs. Stone is generally more common than clay, making stone bricks more common than regular bricks. To make a stone brick in Minecraft, first acquire stones by smelting cobblestone in your furnace. Then, place 4 stone blocks in the shape of a square into your crafting table (or grid). Now you will have your basic stone brick. Basic stone brick: Place 4 stone blocks into a square. Mossy stone brick: Place a stone brick with 1 vine. Chiseled stone brick: Place 2 stone brick slabs vertically. Cracked stone brick: Place 1 stone brick into a furnace. Nether bricks are both fire resistant and blast resistant. When you build in the Nether, nether bricks make excellent shelters because they resist ghast fireballs. Nether brick blocks are formed from individual nether brick items. The nether brick item, which looks like an individual brick, is made by placing netherrack, which is found throughout the Nether, into a furnace. After you obtain the nether brick items, place 4 into a square shape to create 1 nether brick block (often referred to as a nether brick). Nether brick (blocks) can further be crafted into fences, slabs, or stairs. 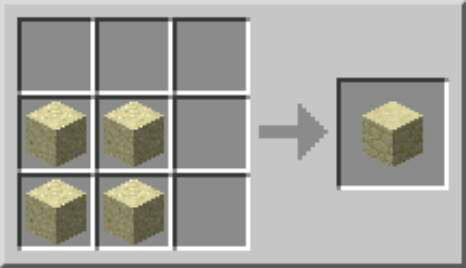 Sandstone block: Place 4 sand into a square configuration in your crafting screen. 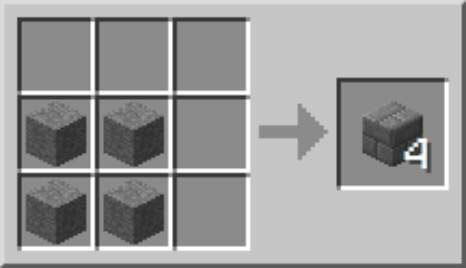 Smooth sandstone: Place 4 sandstone blocks into a square configuration to yield 4 blocks. Chiseled sandstone: Place 1 sandstone slab vertically on top of another one. Additionally, red sandstone can be crafted the same way using red sandstone instead of traditional sandstone. Similarly, it can be made into blocks, smooth and chiseled sandstone, as well as slabs and stairs. Red sandstone is common in the Mesa biome. Chiseled sandstone has a creeper face on it while chiseled red sandstone has a wither depiction. Moss stone is a variation of cobblestone. When placed, the stone orients so in its upper-left corner is an often hard-to-locate letter L pointing northeastward, making this stone (along with cobblestone and netherrack) handy for navigation. The block, with its beautiful green-and-stone texture, is used primarily for building, especially in the Jungle and Mega Taiga biomes. To craft moss stone in Minecraft, place 1 cobblestone and 1 vine anywhere in the crafting grid. The igneous rock known as diorite is nonflammable and has a medium blast resistance similar to other stones (Level 30). An ingredient in crafting granite and andesite, it’s used like any type of stone for building and can be crafted into stone slabs. Diorite comes in two forms: (plain) diorite and polished diorite. Both have a common mixed-gray stone appearance. You craft diorite from 2 cobblestone and 2 nether quartz in a checkered square pattern. Polished diorite is crafted from 4 diorite in a square shape and yields 4 polished diorite blocks. The multicolored brown stone known as granite also comes in both regular and polished forms. To make granite in Minecraft, place 1 diorite and 1 nether quartz anywhere in the crafting grid. If you want to craft polished granite instead, place 4 granites in a square shape to yield 4 polished blocks. Granite requires an extra unit of nether quartz compared to diorite.